An abrasive is a material, often a mineral, that is used to shape or finish a piece of work through rubbing which leads to part object being worn away. While finishing a material often means polishing it to gain a smooth, reflective surface it can also involve roughening the abraded substance as in satin, matte or beaded finishes. Abrasives are extremely commonplace and are used very extensively in a wide variety of industrial, domestic, and technological applications. This gives rise to a large variation in the physical and chemical composition of abrasives as well as the shape of the abrasive. Common uses for abrasives include grinding, polishing, buffing, honing, cutting, drilling, sharpening and sanding. For simplicity, "mineral" in this article will be used loosely to refer to both minerals and mineral-like substances whether man-made or not. Files act by abrasion but are not classed as abrasives as they are a shaped bar of metal. However, diamond files are a form of coated abrasive (as they are metal rods coated with diamond powder). Abrasives give rise to a form of wound called an abrasion or even an excoriation. Abrasions may arise following strong contract with surfaces made things such as concrete, stone, wood, carpet and roads, though these surfaces are not intended for use as abrasives. Abrasives generally rely upon a difference in hardness between the abrasive and the material being worked upon, the abrasive being the harder of the two substances. However, this is not necessary as any two solid materials that repeatedly rub against each other will tend to wear each other away (such as softer shoe soles wearing away wooden or stone steps over decades or centuries or glaciers abrading stone valleys). Typically, materials used as abrasives are either hard minerals (rated at 7 or above on the Mohs scale of mineral hardness) or are synthetic stones, some of which may be chemically and physically identical to naturally occurring minerals but which cannot be called minerals as they did not arise naturally (while useful for comparative purposes, the Mohs scale is of limited value to materials engineers as it is an arbitrary, ordinal, irregular scale). Diamond, a common abrasive, occurs both naturally and is industrially produced, as is corundum, which occurs naturally but which is nowadays more commonly manufactured from bauxite. However, even softer minerals like calcium carbonate are used as abrasives, such as "polishing agents" in toothpaste. These minerals are either crushed or are already of a sufficiently small size (anywhere from macroscopic grains as large as about two millimeters to microscopic grains about 0.001 millimeters in diameter) to permit their use as an abrasive. These grains, commonly called grit, have rough edges, often terminating in points which will decrease the surface area in contact and increase the localized contact pressure. The abrasive and the material to be worked are brought into contact while in relative motion to each other. Force applied through the grains causes fragments of the worked material to break away while simultaneously smoothing the abrasive grain and/or causing the grain to work loose from the rest of the abrasive. Abrasives may be classified as either natural or synthetic. When discussing sharpening stones, natural stones have long been considered superior but advances in material technology are seeing this distinction become less distinct. Many synthetic abrasives are effectively identical to a natural mineral, differing only in that the synthetic mineral has been manufactured rather than been mined. Impurities in the natural mineral may make it less effective. A bonded abrasive is composed of an abrasive material contained within a matrix, although very fine aluminum oxide abrasive may comprise sintered material. 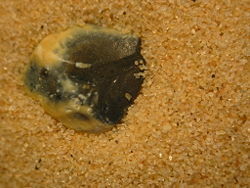 This matrix is called a binder and is often a clay, a resin, a glass or a rubber. This mixture of binder and abrasive is typically shaped into blocks, sticks, or wheels. The most usual abrasive used is aluminum oxide. Also common are silicon carbide, tungsten carbide and garnet. Artificial sharpening stones are often a bonded abrasive and are readily available as a two sided block, each side being a different grade of grit. Various shapes are also used as heads on rotary tools used in precision work, such as scale modeling. Bonded abrasives need to be trued and dressed after they are used. Dressing is cleaning the waste material (swarf and loose abrasive) from the surface and exposing fresh grit. Depending upon the abrasive and how it was used, dressing may involve the abrasive being simply placed under running water and brushed with a stiff brush for a soft stone or the abrasive being ground against another abrasive, such as aluminum oxide used to dress a grinding wheel. A coated abrasive comprises an abrasive fixed to a backing material such as paper, cloth, rubber, resin, polyester or even metal, many of which are flexible. Sandpaper is a very common coated abrasive. Coated abrasives are commonly the same minerals as are used for bonded abrasives. A bonding agent (often some sort of adhesive or resin) is applied to the backing to provide a flat surface to which the grit is then subsequently adhered. A woven backing may also use a filler agent (again, often a resin) to provide additional resilience. Sand, glass beads, metal pellets and dry ice may all be used for a process called sandblasting (or similar, such as the use of glass beads which is "bead blasting"). Dry ice will sublimate meaning that there is no residual abrasive left afterwards. Cutting compound used on automotive paint is an example of an abrasive suspended in a liquid, paste or wax, as are some polishing liquids for silverware and optical media. The liquid, paste or wax acts as a binding agent that keeps the abrasive attached to the cloth which is used to as a backing to move the abrasive across the workpiece. On cars in particular, wax may serve as both a protective agent by preventing exposure of the paint of metal to air and also act as an optical filler to make scratches less noticeable. Toothpaste contains calcium carbonate or silica as a "polishing agent" to remove plaque and other matter from teeth as the hardness of calcium carbonate is less than that of tooth enamel but more than that of the contaminating agent. Very fine rouge powder was commonly used for grinding glass, being somewhat replaced by modern ceramics, and is still used in jewelry-making for a highly reflective finish. Cleaning products may also contain abrasives suspended in a paste or cream. They are chosen to be reasonably safe on some linoleum, tile, metal or stone surfaces. However, many laminate surfaces and ceramic topped stoves are easily damaged by these abrasive compounds. Even ceramic/pottery tableware or cookware can damage these surfaces, particularly the bottom of the tableware which is often unglazed in part or in whole and acts as simply another bonded abrasive. Metal pots and stoves are often scoured with abrasive cleaners, typically in the form of the aforementioned cream or paste or of steel wool. Scratched compact discs and DVDs may sometimes be repaired through buffing with a very fine compound, the principle being that a multitude of small scratches will be more optically transparent than a single large scratch. However, this does take some skill and will eventually cause the protective coating of the disc to be entirely eroded (especially if the original scratch is deep), after which the data surface will be destroyed if abrasion continues. The shape, size and nature of the workpiece and the desired finish will influence the choice of the abrasive used. 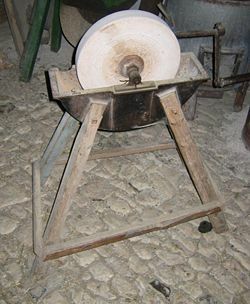 A bonded abrasive grind wheel may be used to commercially sharpen a knife (producing a hollow grind), but an individual may then sharpen the same knife with a natural sharpening stone or a even flexible coated abrasive (like a sandpaper) stuck to a soft, non-slip surface to make achieving a convex grind easier. Similarly, a brass mirror may be cut with a bonded abrasive, have its surface flattened with a coated abrasive to achieve a basic shape, and then have finer grades of abrasive successively appied culminating in a wax paste impregnated with rouge to leave a sort of "grainless finish" called, in this case, a "mirror finish." A finer or softer abrasive will tend to leave much finer scratch marks which may even be invisible to the naked eye (a "grainless finish"); a softer abrasive may not even significantly abrade a certain object. A softer or finer abrasive will take longer to cut as tends to cut less deeply than a coarser, harder material. Also, the softer abrasive may become less effective more quickly as the abrasive is itself abraded. This allows fine abrasives to be used in the polishing of metal and lenses where the series of increasingly fine scratches tends to take on a much more shiny or reflective appearance or greater transparency. Very fine abrasives may be used to coat the strop for razors, however, the purpose of stropping is not to abrade material but to straighten the burr on an edge. Different chemical or structural modifications may be made to alter the cutting properties of the abrasive. Other very important considerations are price and availability. Diamond, for a long time considered the hardest substance in existence, is actually softer than fullerite and even harder aggregated diamond nanorods, both of which have been synthesized in laboratories but no commercial process has yet been developed. Diamond itself is expensive due to scarcity in nature and the cost of synthesizing it. Bauxite is a very common ore which, along with corundum's reasonably high hardness, contributes to corundum's status as a common, inexpensive abrasive. Thought must be given to the desired task about using an appropriately hard abrasive. At one end, using an excessively hard abrasive wastes money by wearing it down when a cheaper, less hard abrasive would suffice. At the other end, if too soft, abrasion does not take place in a timely fashion, effectively wasting the abrasive as well as any accruing costs associated with loss of time. Aside from the aforementioned uses of shaping and finishing, abrasives may also be used to prepare surfaces for application of some sort of paint of adhesive. An excessively smooth surface may prevent paint and adhesives from adhering as strongly as an irregular surface could allow. Inflatable tire repair kits (which, on bicycles particularly, are actually patches for the inner tube rather than the tire) require use of an abrasive so that the self-vulcanising cement will stick strongly. Inadvertently, people who use knives on glass or metal cutting boards are abrading their knife blades. The pressure at the knife edge can easily create microscopic (or even macroscopic) cuts in the board. This cut is a ready source of abrasive material as well as a channel full of this abrasive through which the edge slides. For this reason—without regard for the health benefits—wooden boards are much more desirable. A similar occurrence arises with glass-cutters. Glass-cutters are have circular blades that are designed to roll not slide. They should never retrace an already effected cut. ↑ Grinding Technology Glossary, Abrasive Engineering Society. Retrieved March 20, 2018. ↑ Grinding Wheel Institute, Grinding Stresses: Cause, Effect, and Control (Grinding Wheel Institute, 1964). ↑ OSH Answers: Metalworking Fluids, Canadian Centre for Occupational Health and Safety. Retrieved March 20, 2018. Grinding Wheel Institute. Grinding Stresses: Cause, Effect, and Control. Grinding Wheel Institute, 1964. This page was last modified on 24 March 2018, at 14:55.